The gradual but steady systematic ploy of genocidal elimination of soldiers of Biafran stock presently serving in the Nigerian army has assumed alarming dimension. The Hausa-Fulani sponsored Islamic agenda of conquest, is primarily aimed at desecrating the ancestral heritage of Biafrans. In it's drive of well orchestrated Islamic mandate, the caliphated Nigerian military has perfected it's evil plots to silently and strategically annihilate their perceived enemies considered threats to their planned strike targeted against Biafraland. The Intelligence Unit of Family Writers Press authoritatively gathered incriminating information evidencing secret and deadly schemes orchestrated by Islamic Jihadists within the rank and file of the Nigerian military in perpetrating this mayhem. It is an established fact that Biafrans serving in the Nigerian army are prone to annihilative attacks in their various locations of duty especially in the Northern region. What is even more disturbing is the number of Biafrans that are being deliberately set up, ambushed, maimed and killed on regular basis. Very recently, majority of the soldiers being deployed to troubled spots in Northern part of Nigeria are from the SouthEast and SouthSouth regions of the contraption. The masterplan of the military hierarchy is to totally and pre-emptively eliminate these Biafrans serving in the Nigerian army, to stem their possible home coming to defend their people and downsize the population of young/able bodied Biafrans in the event of jihadistic attack/war. In recent reported cases of Boko Haram terrorists' incessant deadly ambushes against the Nigerian army, Family Writers Press crew can confirm that the military authorities going by their antecedents, are deliberately and with calculative sinister attempts, setting up soldiers of Biafra descent, in unrelenting terrorists killings. Some of the soldiers who narrowly and severally escaped death at the battle fronts, recounted how Boko Haram terrorists had ambushed their convoy on tip offs by Fulani army commanders, who insisted that they take particular routes to "marked locations". These according to them, were designated spots deceitfully mapped out in repelling the Islamic terrorists attacks. These Nigerian Islamic army commanders acting true to their secret agenda, would signal their Boko Haram brethren to unleash terror of elimination and crush "those inyamiri infidels". Further investigations reveal that in the event of any distress call of imminent Boko Haram terrorists attack in a particular area, a Biafran commander with deployed troops who are exclusively Biafrans, are urgently ordered by the military high command to hold-up tactical movements for possible back-up. This is done to conversely enable the terrorists make withdrawals against repellant attacks. Oftentimes, the Biafran soldiers are moved to locations planted with deadly explosives where many of them are killed. Any Biafra restoration struggle sympathizer amongst them, is either poisoned through food/water or shot dead at night under the guise of accidental discharge or better still, tagged a victim of enemy attack. Response to any question regarding position of allegiance confirms one as either a perpetual slave or a courageous fellow that cannot compromise his ancestral identity. The recent ambush and death of 700 Nigerian troops in both Borno and Yobe States (Northern Nigeria), with majority of victims from Biafraland, very clearly substantiates and authenticates our report. 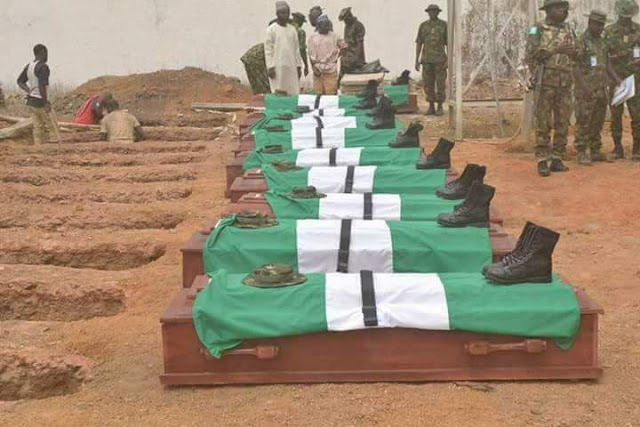 The increasing spate of killing of our young men serving in the Nigerian army, affirms the reality of the Islamisation agenda of the Nigerian government under a muslim fundamentalist President, Muhammadu Buhari. This is in consonance with years of progressive clandestine motivate of totally wiping out Biafrans from their ancestral lands for Islamic occupation. The activities of these Hausa-Fulani jihadists led by their Grand Patron, Muhammadu Buhari, in concert with their British overlords, have proven beyond doubts that this mad enterprise is driven by their egocentric interests in oil and gas that are richly and variously deposited across Biafraland. Therefore, perceived enemies and obstacles must be crushed by every means possible under whatever coloration. Unfortunately, it has not yet dawned on them, the resolute, dogged, courageous, ferocious and damnable spirit the present generation of Biafrans are made of in their irreversible quest in reclaiming all their lost inheritances. This slogan: "Biafra or death" as echoed by the leader of the Indigenous People of Biafra (IPOB) worldwide, Mazi Nnamdi Kanu and millions of his die-hard loyalists, is a definitive signal. The activities of Biafrans presently serving in the Nigerian army are being very closely monitored that their privacies are randomly and consistently pried into. Their movements, social media concerns and freedoms unlike their non-Biafran counterparts are strictly regulated. The remains (corpses) of fallen brethren brought down by the enemies' (terrorists) fire are often secretly disposed off (buried) in the forests, with rushes to dish out concocted and misleading press statements, denying deaths of soldiers. Bereaved wives are lied to that their husbands were on special duties, devoid of call contacts. The Nigerian army is structured on lies and deception. The leadership which is overwhelmingly under the control of Islamists (Fulanis) are genocidic with consuming passion to drastically annihilate or reduce Biafra population. It is now essentially incumbent upon every Biafran to heed the call of Mazi Nnamdi Kanu and other well meaning Biafra agitators for our brethren presently serving in the Nigerian military to relinquish whatever position and duty and return back home. This is the set time to join in the struggle for the total restoration of the sovereign nation of Biafra. We should not mortgage our future and that of the upcoming Biafra generations for frivolities and slavishness. Those with ears let them hear!!! Biafran is life and all must strive to enter it including Biafrans in zoo army or loose their lives in zoo under jihadists islamists with mbuhari their leader.biafra lives!!! !